I wrote a similar post last year, and I thought I’d compile a new, updated list of the best possible gifts for the Austen lover in your life. I, of course, still stand by all of my recommendations from last year. Brookish (who I mentioned last year) has P&P ornaments for sale. And I would highly recommend them. Actually, I would like some for himself, but this isn’t my Christmas wish list. Over in the world of the Lizzie Bennet Diaries, you can buy related merchandise. I highly recommend the “Everyone deserves tea” mug. Andrea of The Bookish Life has plenty of Austen-related paraphernalia. I really want a Pride and Prejudice necklace to go with my P&P bracelet from The Bookish Life, but again, this isn’t my Christmas life. Out of Print has plenty of Pride and Prejudice related items. For further ideas, check out last year’s post that’s linked at the top of the page. I have plenty of links to Amazon ideas there (like books and movies) and a few recommendations from Cafe Press. If you have an idea I didn’t post here, feel free to comment below. I’d love to see more Austentatious gift ideas! The latest pattern from the TFA Year in Colour (September) was Framed Slouch using the utterly divine Orange label (merino, cashmere, and silk in a worsted weight that is somehow related to fuzzy darling baby kittens. The colour was “mosaic,” a unique and lovely blend of yellows and oranges and blues. 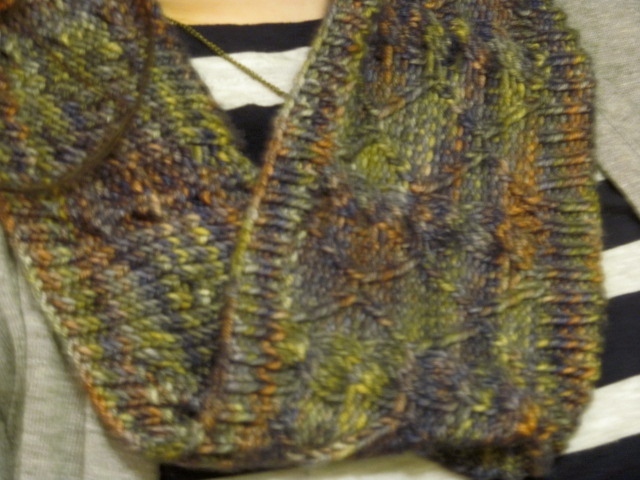 I loved the yarn and the color. And the pattern was super cute too. But there was a problem. I am not a hat person. At all. 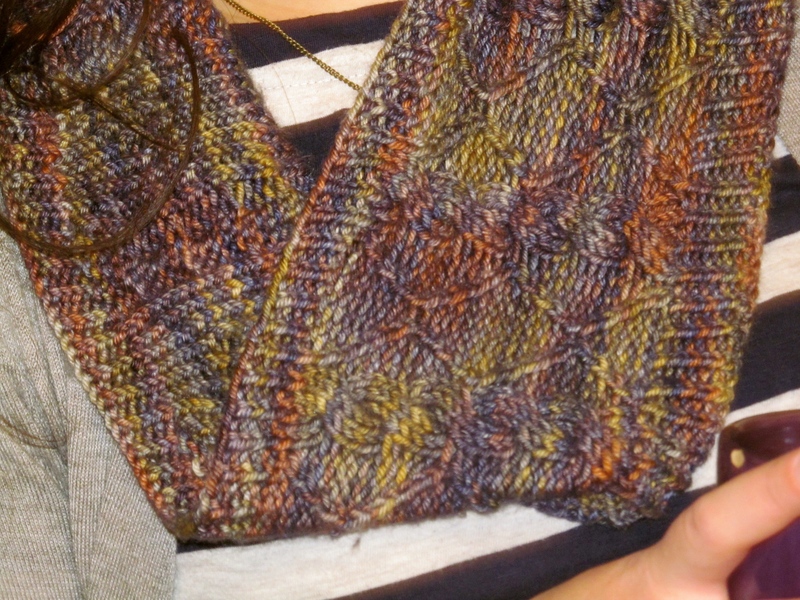 So, I fiddled about with things and made myself a cowl instead. And now, it’s finally done. And it is delightful like kittens and snuggling with kittens. More details can be found on my ravelry project page. 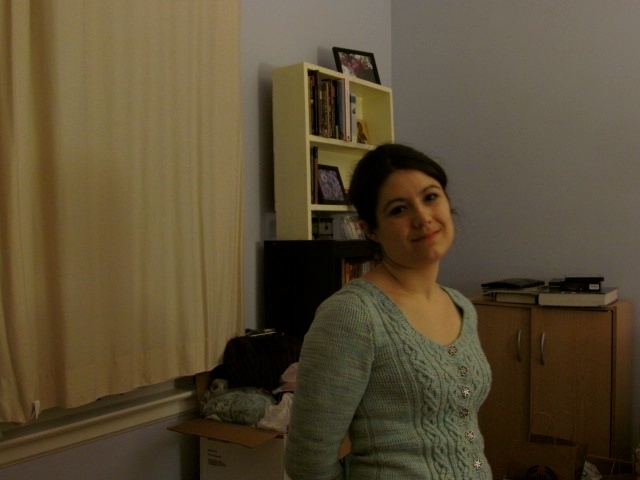 At the end of March, one of my favorite designers published a new sweater pattern, the Jackson Creek Cardigan. I fell instantly in love with the pattern (which I immediately owned due to purchasing the Urban Collection, vol. 2 when the first pattern was released) and I immediately went over to TFA and bought six skeins of yellow label (dk weight) in frost, a wonderfully icy blue with just the loveliest hints of grey. And then I left the yarn in my closet until about two months ago when the TFA group on Ravelry started a Knit-A-Long for the Urban Collection. (The KAL ran from September 14 to October 14.) 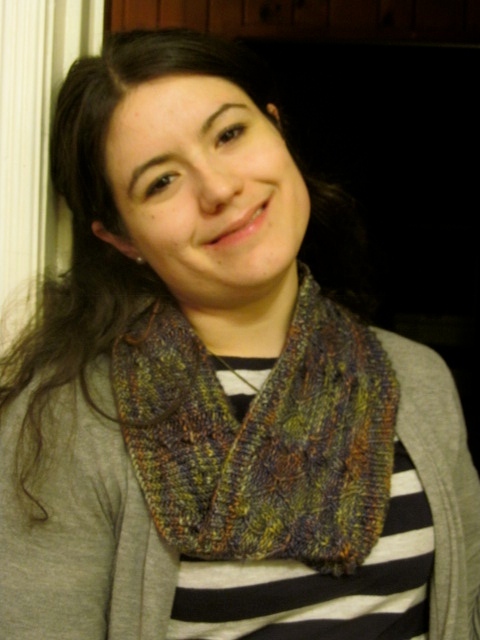 I immediately set to work knitting my Jackson Creek, and while I didn’t finish within the time limits set for the KAL, I’m finally done. 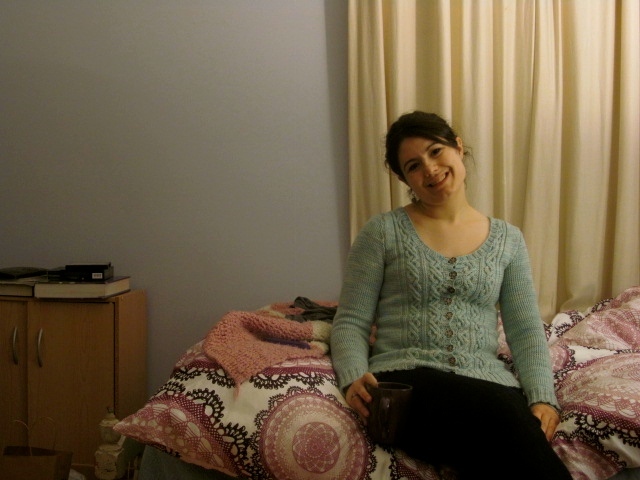 I finished the sweater on Friday night, blocked it, and I wore it to work today for the first time. I’m in love with it. Another teacher told me it was lovely. (There was also the coworker who told me it looked terrible when the first teacher told him that I had made it, but I’m going to ignore that comment.) Long story short? I love it. I absolutely love it. 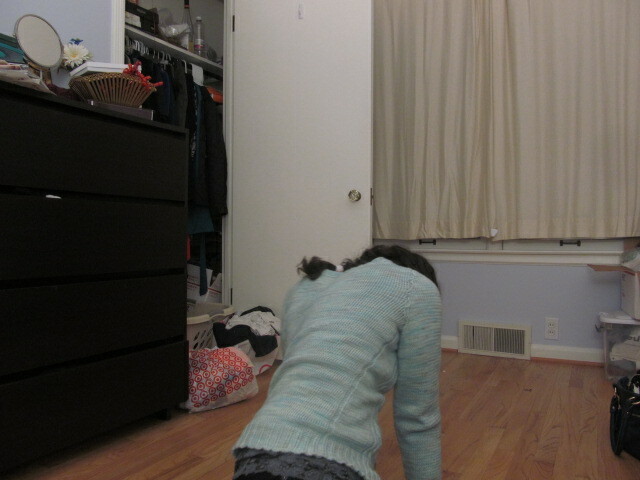 I know my head is chopped off, but it’s the best pic I could get of the sweater itself. I made a few modifications for this. 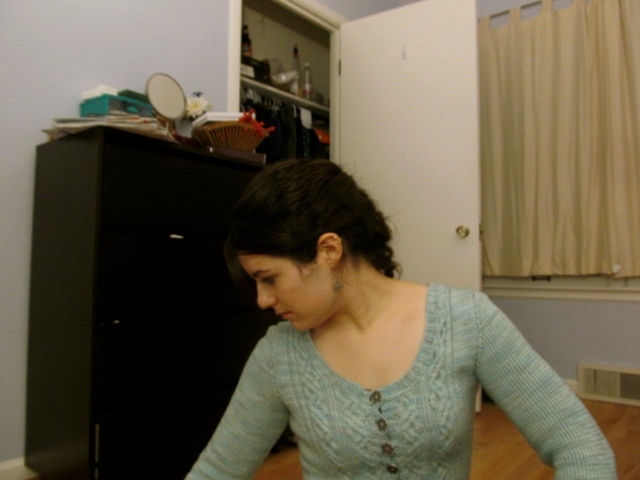 I lengthened the sleeves to make this a more wintery sweater rather than the spring sweater it’s written to be. I also knit the body as one pieces because I wanted to. For more info, see my Rav project page. Below are two photos (taken on my iPod, so please excuse the quality) of my newest project. 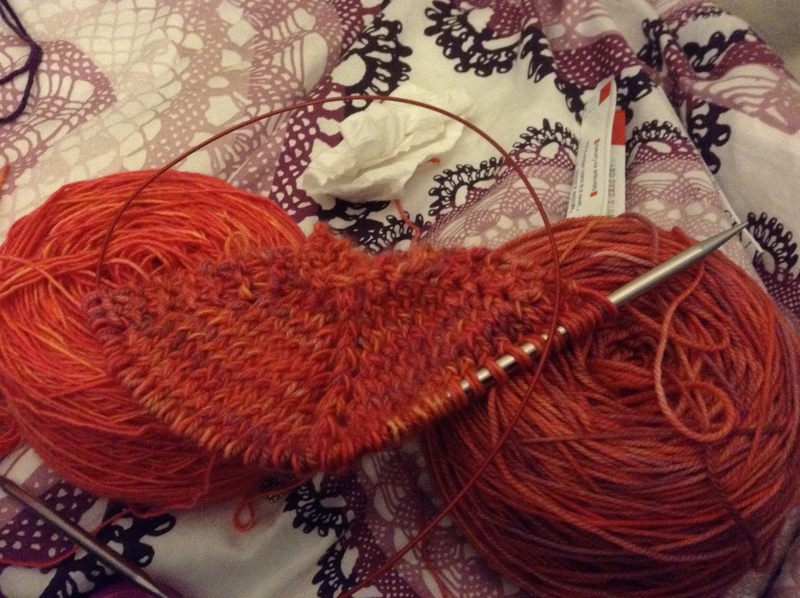 I’m modifying a pattern that I have previously published to be larger and to use a heavier weight yarn. 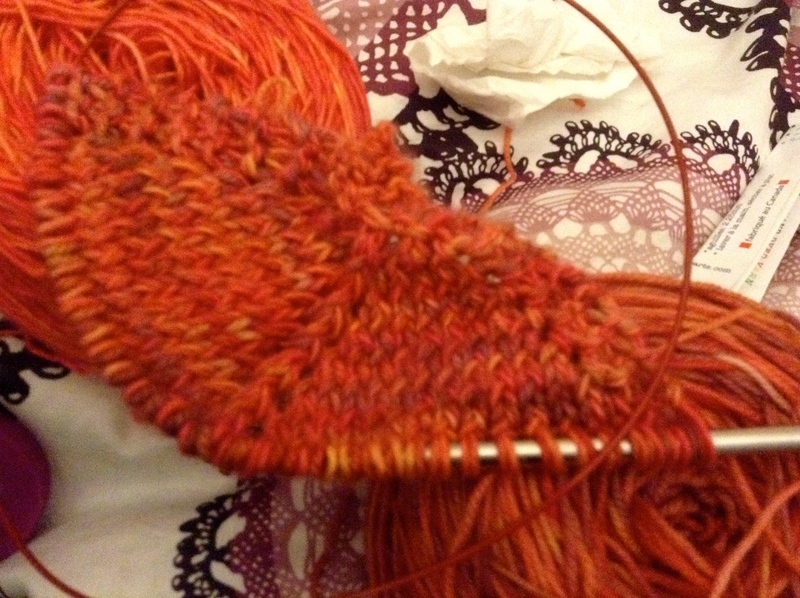 I’m double-stranding two yarns together to create an interesting color effect. And I can’t wait to show you the finished product.